AVA Live Radio is a music industry network. We work to secure online blog premieres that will drive valuable traffic to your music and let important people know about you. We are partnered with many music blogs, Taste makers, online magazines, and music curators who can help draw attention to your music projects and bring opportunities to you. What are social media funnels? Social media funnels are created by dripping out carefully created social media content about your project over time to multiple social media pages all over the internet. Each one of those posts acts like a breadcrumb leading people to one place which in this case is your featured press page we will create for you on the website. When we post about you for 15 days, all of those social media funnels keep turning as people retweet, share, like, comment and interact with them. Some social media content stays live for months and some have shorter life spans but all are effective in branding and helping you to gain exposure to new targeted music fans. We have a viral reach for our posts across a minimum of 40 different Twitter pages. All of our contributors are very supportive and helpful in pushing content forward so that we can maximize the reach of every post we create across Twitter, Facebook, Instagram, Tumblr and linkedin. We shape the content you give us to maximize this reach and then give you stats along the way. Let’s get you in our viral spins. How does the Press release work? We have been building relationships with people in the music industry, movie and film industry, sync licensing and music journalism for 10 years. These are all key people that you need looking at your music every time you launch. We create and send a press release out every Monday and Wednesday to all the people on our list so they can take a look at your story, listen to your music and start getting to know you. If someone reaches out to us directly to offer you an opportunity, we make sure the opportunity is offered to you and help you navigate through any questions you may have. How MUCH Exposure do I get each time? We have not had any bad feedback from our artists and we have a high rate of returning regular launches from record labels, independent artists and management teams who love to work with our fast professional team. Our feedback says everything. Artists typically love the Behind The Music Live Interview series and the New Music Segments to showcase their newest tracks to both industry and fans. Each package is filled with promotional opportunities and we are always customizing them with each customer to make them better. All segments launching on our broadcasts are pushing to 14 different channels for added exposure reaching an average of 2 million listeners a year. The segments do not disappear after the airings, they stay out on the streams as On Demand episodes for ever as a digital footprint tracing your musical journey in history. We also cycle all the segments through social media multiple times over months for that added push to new music fans. We do all the work so you can keep that great music coming. - Rock Music Mania : An exciting mix of Metal, classic rock, indie rock, and alternative music from all over the world. Kick the door down! - Rap Caviar Segment (hiphop) : Hip Hop's finest artists who focus on telling that story that needs to be told. - Fresh Folk & Acoustic Soul & Country Music Segment : Amazing music that tells a story coming from quality songwriters in the Country, folk and indie pop genres. - Electronic Indie Pop & DJ : Pump up your weekend with hot new sounds and creations from popular dj's and electronic music creators. - Chill Vibe Mix : A chill track playlist spin of music created with one purpose. To enhance your evenings and weekend mood through great sounds and experiences. - The Mood Booster Mix : A range of mood altering and uplifting music that will be shared to our filmmakers and audience seeking an inspiring mix of new artists. * AVA Live Radio feature spot on the segment of your choice complete with announcement made by the DJ on air. * Bio, social media links and streaming link to your song posted on the AVA Live radio website as well as the Medium and Tumblr Music news section. - A.V.A Live Radio website. Listed with image, bio and social media links on New Music segment page. (560,000 music subscribers) This website currently has 3.9 million views a month. * Press Release: Our mailed press releases includes more than 3,600 fm and college radio stations in larger markets, film makers, commercial advertising agencies, booking agents and music journal writers. * Your Song placed on our segments Spotify Playlists in the top 10 spot added in niche genre rotation. * Your music and story Featured in our Behind The Music Series on AVA Live Radio. (560,000 music subscribers) Our website currently has 3.9 million visits per month. - AVA Live Radio Tumblr music blog feature post in Music News and Industry. * Your Song placed in our Spotify playlists rotation. * Professional Digital Banner adds created by our art department to enhance the marketing. * Social Media Marketing across facebook, twitter, instagram, google plus, tumblr & linkedin. Using your music links. * Multiple Facebook feature music add placement on different music accounts and groups. Featured article on our website which includes cover art. (see samples) (560,000 music subscribers on email) Our website currently has 3.9 million visits per month. 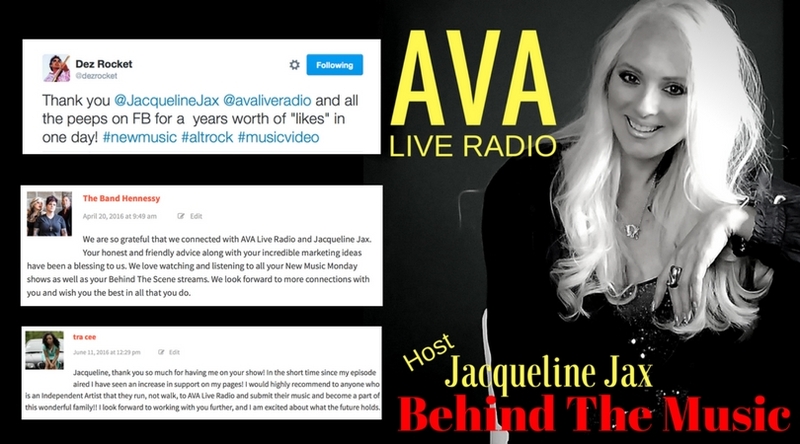 You can choose between a Behind The Music live interview on AVA Live Radio and all 13 broadcasting channels or a (non-interview) New Music Segment Push across our broadcast of your featured single. AVA Live Radio Tumblr music blog feature post in Music News and Industry. - a featured announcement on Nationally popular website “Medium” in the Music Business News Section. BTR, Spotify, iHeartRadio, Anchor fm, iTunes, Google play, Amazon Alexa, Google Home, Apple CarPlay, Android Auto, Stitcher Podcasts. THIS IS A HIGHLY RECOMMENDED PROMOTION AND USED BY ALL OF OUR RECORD LABELS CLIENTS. Check our customer feedback: here?